I never intended this blog to be a space for reviews, but this experience we had at dinner is too funny not to share. I am a frequent Groupon user. One of Groupon’s newest features is their Now! Deals, where business offer deals for use today. Unlike the usual buy-now-use-later type of deal, this one is buy-now-use-now. When I was looking for inspiration for my birthday dinner, I checked there first. I found $12 for $25 to Crave Brasserie and Wine Bar, a new restaurant in Amesbury. Every time I’m in downtown Amesbury, I always remark at how cute it is, but we never go there. So I figured we’d try it out. If you’ve been reading this blog, you know I almost always include links to whatever I’m telling you about. I would do that here too, except that their “website” is a Facebook page. Instead I’ll give you this link and we can pretend that they have a website. Crave is located right off of downtown Amesbury next to a huge parking lot. I’m nearly positive that there is more parking spaces than chairs. Most recently, this site was a coffee-house. Before that (but maybe not immediately) it was a train station. We were seated in the only table for two in the dining room area. They have high tops in the bar, but we didn’t venture back there. The dining room is small – only eight tables. Still, it took 10 minutes for our server to acknowledge us and another 10 minutes to get our drinks from the bar. A note about the drinks. “Brasserie” is french for “brewery”, which is kind of misleading when you consider what a “brasserie” has come to stand for in today’s restaurant speak. Still, we expected some more interesting choices on both the beer menu and the wine list. There were five beers on draft. Sam, Sam seasonal, Allagash and two Rapscallions. So yay, I guess, that they’re supporting a local brewery. But five beers? There’s a wider beer selection at Uno’s. I consider myself a fledgling wine snob. I almost always scan every wine list for varietals and location. I like to see if the wine is from any place I recognize from our honeymoon to Napa and Sonoma. If I go to a wine bar and I see Kendall Jackson and Cupcake on the wine list, I’m not going to take you seriously. If I can buy it at Shaw’s, why would I come to your establishment? If you’re not going to have note-worthy wines, don’t bother call yourself a wine bar. The food came in average time and tasted okay. They made their overcooked dry french fries palatable by drowning them in gravy. There was some unidentified shreds on the top of my steak. They might have been potato peels. I thought they were onion straws, but no, so I just moved them to the side and forgot about them. Mr. Wonderful ordered potato crusted haddock that had a weird cream sauce. Not enough lemon to be a lemon sauce, but too much to just be an accent. We asked to see a dessert menu, but there wasn’t one. There were three things. I picked the chocolate mousse cake. Mr. Wonderful was disappointed that I didn’t pick the maple crème brûlée with candied bacon, but I’m kind of a purist when it comes to crème brûlée. This is where things got funny. I took one bite of the cake and thought that maybe they burned it. Then I thought I tasted butane. After three or four bites, trying to figure out what was wrong with the cake, I decided I wasn’t going to eat it. It was gross. When our server came over to ask us how the cake was, I asked her if it had ever been on fire. Her response? “Does it taste like it? I’ll get you a new piece.” So wait, was it on fire? Because I kind of expected her to say, “On fire? No!” I didn’t think she’d agree with me. Mr. Wonderful couldn’t stop laughing because, out of all the ways I could have complained about the cake, I went straight to “Was this cake on fire?” Now we’re left speculating about all the ways that it could have been on fire. Did they microwave it too long? Did they burn the mousse? How is the second piece going to be different? It turns out that sometimes the chef likes to torch the cake to crisp up the sugar. HUH? It’s chocolate cake! You don’t need crispy sugar. If you’re looking to eat something crispy, you’re not going to order chocolate cake? So I’m guessing that the kitchen staff isn’t classically trained or anything. My third favorite thing was trying to pay with the Groupon. If you’re going to offer a Groupon that’s only good for one night, you’d think you’d let the staff know when they started their shift. Every time I’ve used a Groupon, the server or cashier has known exactly what to do. It wasn’t really a big deal. By this point, we were already late for trivia, so what was another five minutes. But it was just funny to give my phone to the waitress, watch her walk over to another waitress, explain to that table what a Groupon is, disappear and then bring me back my phone. I hope she didn’t call China! For most of you, Wednesday was just another day. You probably remarked that August is over and how fast the summer had flown by. But not me. I was too busy turning 30. There’s nothing like a birthday to make you feel all philosophical. You’d think I’d be fine turning 30 since I can never remember how old I am anyway. “Honey, how old are we?” is a very frequent question in our house. I was totally ready for 30. It was 25 that hit me really hard. I remember sitting in my boss’s office, freaking out about all the things I should have accomplished by then. I then went on to celebrate my birthday at the Olive Garden with my friends and their husbands and the guy I’d just started dating. He ended up leaving dinner to go pick up his friend whose car died 90 minutes away. Right. So turning 30 couldn’t be worse than that. I’m married now to the best guy I’ve ever dated (luckily for him, I set that bar really low). I’m in probably the best physical shape I’ve ever been in (again, I set the bar low there). I have an awesome job, an MBA and a fairly decent condo that we’ve totally outgrown but could be much worse. Things really fell into place in the last five years. So even though the card from my parents with the big fat 30 on front jarred me a little, I think I’m going to come out okay. Like everything, it’s not what’s on the outside that matters. It’s the inside that counts. See? That’s more like it. If you don’t do a champagne brunch in Vegas, you must not like food. Because the food at a champagne brunch is top notch. Omelet bar? Duh. Carving station? Of course. Pesto mashed potatoes? Absolutely. And the mimosas? Our server eventually gave up and brought us a carafe of orange juice and filled all of our glasses with champagne. That’s how we roll. After breakfast and checkout, Mr. Wonderful and I took off for the shops. We like to get magnets and Christmas ornaments from everywhere we go and I had been slacking on this trip. We ended up at the Miracle Mile. It was a pretty nice mall that even had a rain storm show every half hour. It’s funny to be in a place that has to manufacture a thunderstorm. 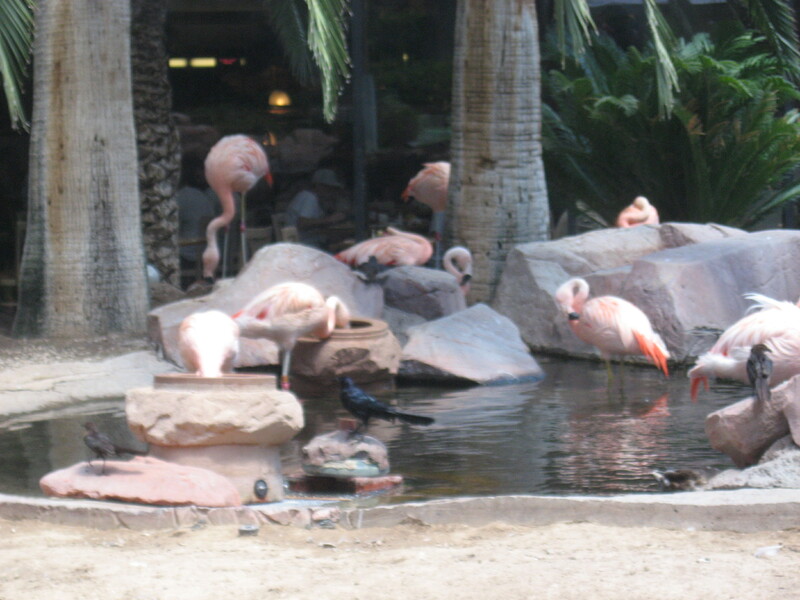 Before we met up with the rest of the gang, who was losing the last of their money at Bill’s, we stopped back at the Flamingo to, um, see the flamingos. Once we got to the airport, the fun began. We were scheduled to leave from Gate C1, right after a flight to Boise and a flight to St. Louis. Both of those flights were delayed, so we got pushed to Gate C3. Unfortunately, no one told our pilot, who landed at C1. So back we go. Honestly, it wasn’t the worst thing that could have happened, but it was annoying. 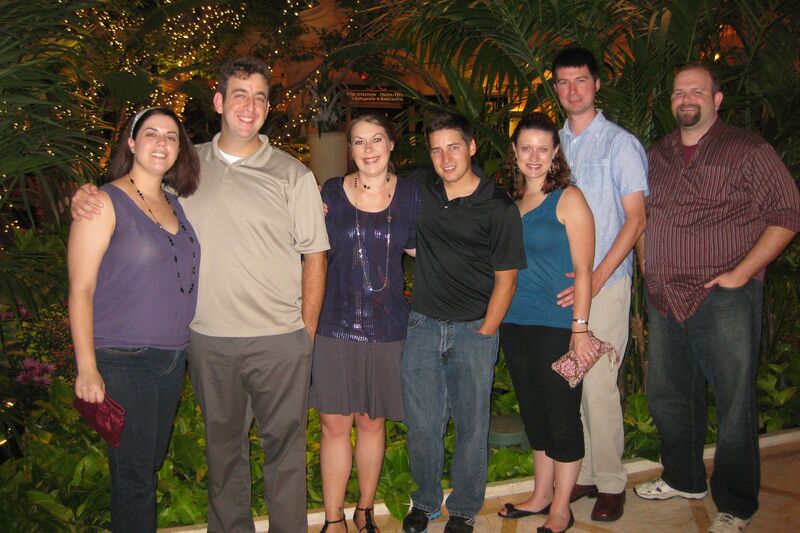 We fared better than Kellie did; she ended up stranded in Vegas hours after we left. Too bad that timing didn’t work out! Thankfully, we landed pretty close to on time. And that’s it! 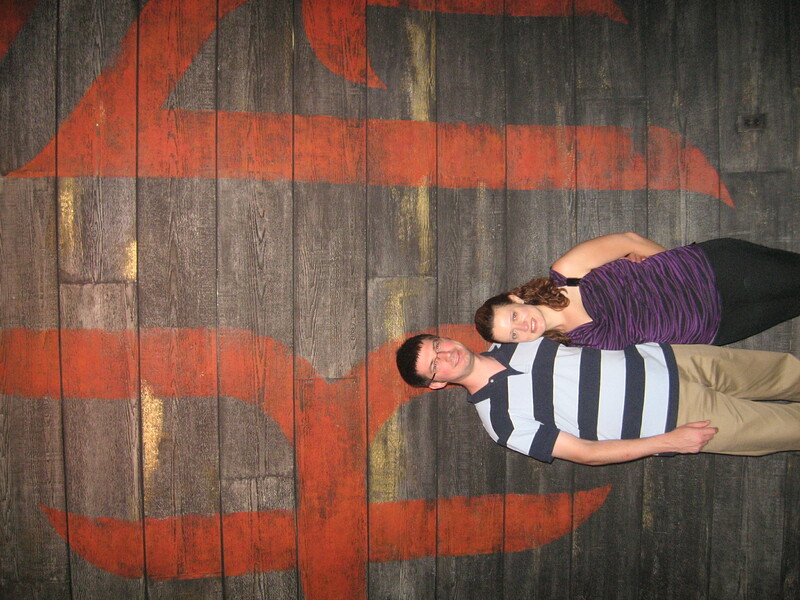 Our first time in Sin City was sometimes crazy and chaotic but it was a lot of fun. We definitely saw a lot and yet barely broke the surface of what Vegas has to offer. We had some really awesome food and some really cheap drinks. We saw people of all walks of life. My parents are going for the first time in October. I think I’m going to live vicariously through them for a little while. Mr. Wonderful and I enjoyed breakfast on the roof deck at Margaritaville. Despite its name, they don’t serve margaritas at breakfast, so I had my first Bloody Mary with Patrón. And salt. I was pretty sure the salt was burning a hole in my throat. We also had huge omelets and yummy hash browns! I was fully liquoredgeared up for a day at the dodgeball courts. While we were on the roof deck, we experienced another Vegas first – a freakin’ rain storm! That’s right, we went to the desert in August and had rain. When you add the rain to the misters on the deck, we were getting pretty wet. It rained for at least a half hour, until we got to the dodgeball tournament. Through some weird coincidence, it was a Burgundy/Geoducks matchup in co-ed foam ball. The team was psyched to play a team that we actually liked. The game was a best out of five elimination. 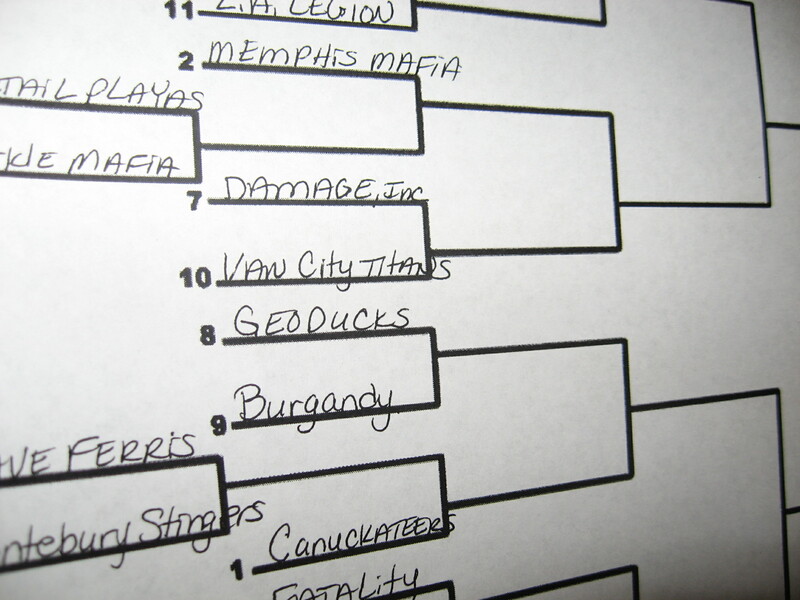 Long story short, Burgundy took the Geoducks to five games, but dropped the last one and got knocked out of the tournament. Then there was a lot of waiting, one run to Starbies by yours truly, and then Burgundy vs. the Canucketeers in open foam ball. After dropping all three games nice and early, we were done. Most of the team decided they were dodgeballed out and opted to leave. We hugged the Geoducks goodbye and made it back to the Flamingo and the Sin City Brewing Company. The team drowned their sorrows in beer while I tried the Sloth, which was delicious despite the lack of gummy worm that was in the description. While we were sitting at the bar, Mr. Wonderful managed to win himself $100 in video poker. Yippee! I was so excited about dinner. (You’re not surprised, right?) I had done some research before we left about the best places to eat in Vegas. One of my favorite Food Network shows is Best Thing I Ever Ate, where your favorite Food Network chefs show you delicious meals at various restaurants around the country. 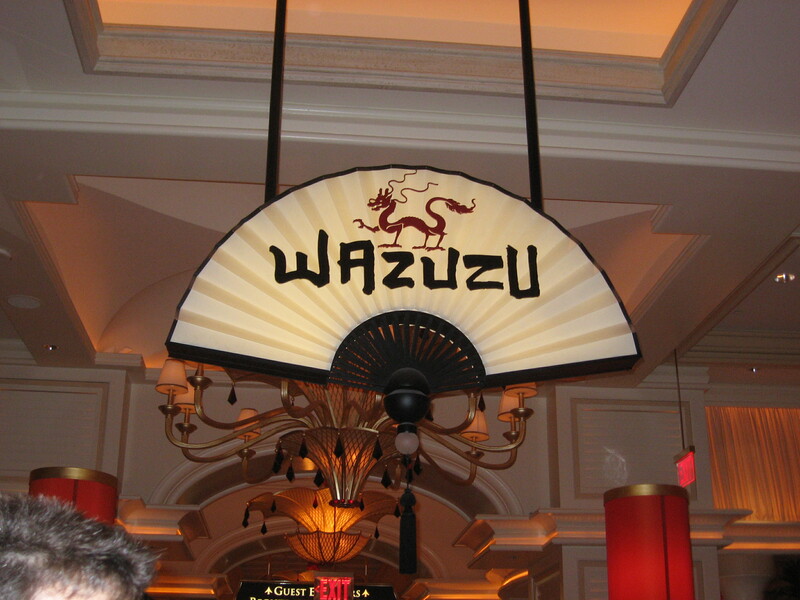 On Best Thing I Ever Ate With Chopsticks, Giada recommended the Drunken Noodles with Chicken at Wazuzu. I’ve never known Giada to lead me astray, so I pushed hard to take the group there for dinner. They didn’t take reservations, so it was a crap shoot (HA!) but at 6pm, we called ahead and found that there was no wait. 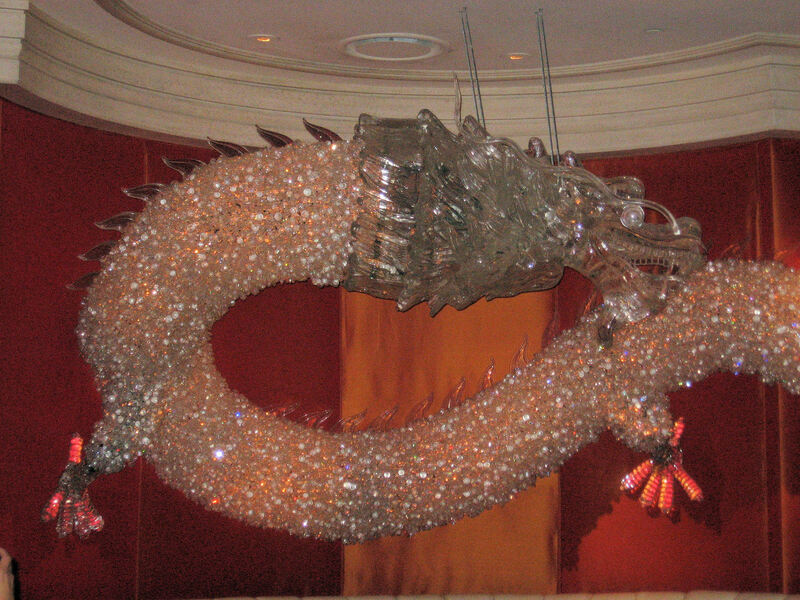 We hadn’t ventured to The Wynn/Encore yet and it was easily the most gorgeous casino we visited. I’m sure the rooms are way outside my price range, but what a nice place to visit! See, the Wynn is pretty! It has Christmas lights! Dinner was wonderful. I really couldn’t decide what to order. I asked our server, Andy, for a recommendation, which wasn’t helpful at all since, of course, all their meals are equally wonderful. In the end, I let Giada down and ordered the Lo Mein. It was awesome. Mr. Wonderful got the Nasi Goreng, which he really liked but was a little too spicy for my taste. You get to pick your level of spiciness on your entrée, which I thought was pretty interesting. There were a few drunken noodle orders at our table, and everyone spoke highly of it. Our waiter overheard Erica say that her meal was spicy and offered to remake it. He was generally concerned, though Erica wasn’t complaining at all. Nonetheless, I thought that was really nice of him. Check out this dragon! Awesome decor! Several months ago, Mr. Wonderful and I were watching One Hundred Ways to Leave a Game Show, when the question came up about which one of these three is not a casino in Las Vegas: Atlantic City, Ellis Island or Casino Royale. We immediately thought Ellis Island would be a terrible name for a casino because, well, we’ve been to Ellis Island and it’s mostly full of despair. Sure, it’s the gateway to a world of opportunity, but in and of itself, it doesn’t look like any fun. It turns out, we were wrong. (It’s Atlantic City, in case you were wondering.) We immediately found Ellis Island’s website and learned that they are known for being an awesome brewery/casino/karaoke bar. That’s a winning combination if I’ve ever heard of one so we talked the team into taking a trip. That’s where it mostly went to hell. The best thing about Ellis Island is that five beers and one So-Co and root beer were $13. After we lost lots of money at the craps tables, roulette and video poker (except Erica, who managed to get $60 for a full house), I really wanted to do karaoke. Before I met Mr. Wonderful, I was doing karaoke at least once a week at Oriental Gardens. A lot has changed between then and now and I don’t do karaoke nearly as often. But Ellis Island had my signature song in the books (Fergalicious, obviously) so I put it in and waited. There weren’t enough seats in the bar, so we stood by the door and waited. And waited. After about a half hour, I checked in with the DJ and found I was 16 people back. 16! Yikes! So we left. If you’ve ever been excited about something and then looked at your group of friends only to find that they look absolutely miserable, you know why. 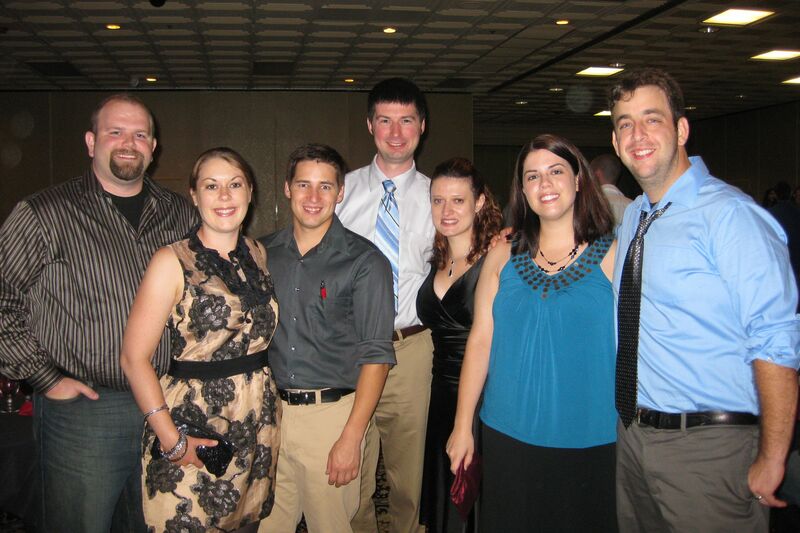 I couldn’t subject six other people to that when they clearly weren’t having any fun. But I was upset about it. When I got outside of the casino, I realized that we weren’t on the Strip, so there wouldn’t be cabs waiting to take us back to the hotel. So I started walking. It was just a bad end to what should have been a good night. Win some, lose some, I guess. Friday was Dodgeball day. It started right after breakfast and lasted, um, all day. It’s cute how eager they are! If you’ve seen the Dodgeball movie, you’d be strongly disappointed when you got to the Tarkanian Basketball Academy. First of all, it’s a small space for a lot of people. The Basketball Academy has 4 courts. Dodgeball took up two courts and a basketball camp took up the other two. Holy crowded, Batman! Also, it was not aired on ESPN The Ocho and no, Cotton and Pepper weren’t announcing. Friday was all about seeding. Each team gets about an hour to play two other teams and the amount of wins you get determines your seeding for the next tournament. 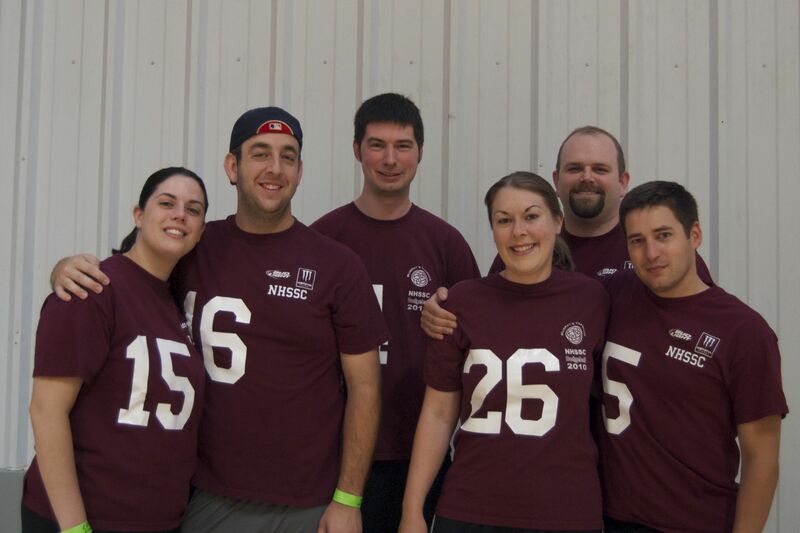 Our team, Burgundy, was registered for two divisions – open foam ball and co-ed foam ball. There were plenty of other leagues, including all-female and rubber balls. In our case, the co-ed round robin was lackluster as the was some type of misunderstanding and we only had to play one team, the Geoducks from Washington State. You know how fun it is to watch an hour of dodgeball between the same two teams with no real outcome? Not very much fun, thanks for asking. I played a lot of cell phone games. When that was over, chaos ensued. They called it Last Dodgeballer Standing. From the non-player perspective, it looked like a crap-ton of people divided on two sides of a basketball court, throwing and screaming and barely moving because they’re packed like sardines. Apparently on the court, it wasn’t much better. There were no teams so you could get anyone out, including people two inches from you. After that, the recreation league started. Remember when you were at summer camp and you got to learn random field games? Yeah, it was like that. By this point, I’m starving. The snack bar sold candy, Gatorades, popcorn, nachos and hot dogs. None of that is on the diet. When the open foam ball round robin started, I’d lost my patience. I crossed the street to Palace Station and went immediately to Starbucks. Being from Boston somehow got me an extra squirt of caramel. Thanks Armando! After I finished my parfait, I was faced with a decision. Go back to dodgeball or be the sketchy single girl at the craps tables. So, craps tables it is. My mere presence cleared out the first table, so I made my way to the other table. After a few ups and downs, I decided to cash out when Mr. Wonderful called. I think I played for an hour or so before the text message came in. I threw some chips on the table as a tip and bee-lined to the cashier. I was up $2 over what I put in. YAY me! Friday night was the dodgeball banquet back at Palace Station. This is where the magic happens. It looks like every sports banquet you went to in high school, except with drink tickets. There was a slide show from earlier in the day and speeches from the board of directors. 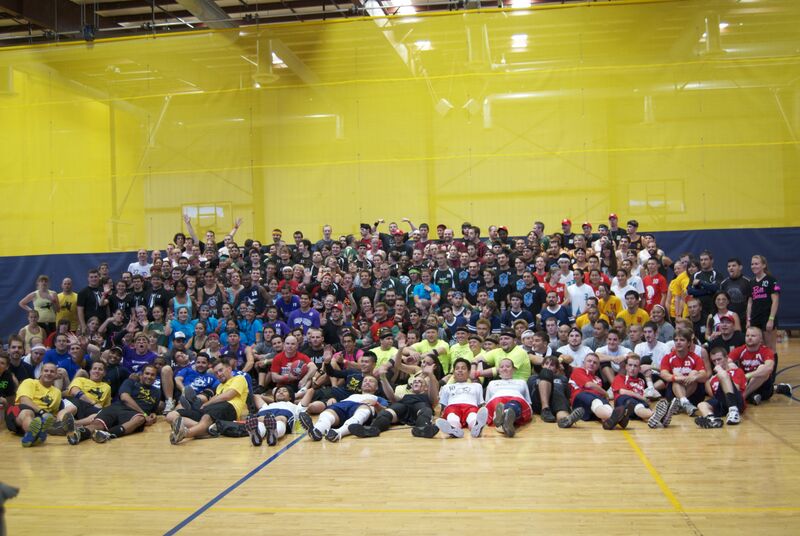 It was fun to see all the teams together. There were teams from everywhere – Australia, New Zealand, Canada, New York, etc. We were the furthest East team, but certainly not the furthest traveled. Also, the Palace Station has delicious meatballs. Who knew? Afterwards, we went back to Bill’s for more late night gambling. Since casinos are huge black holes for time, we stayed out far too late. We woke up early for the sake of getting discount tickets to Ka. Honestly, getting tickets couldn’t have gone smoother. We had talked prior to getting in line that our first choice would be Ka and our second choice would be Love. We needed a later show to accommodate the first of the dodgeball activities, namely registration and the captains’ meeting. We got into the VIP line behind two other couples right when Tix 4 Tonight opened. (Pro tip: You receipt from the previous day’s sale gets you line privileges. Honestly, if you went one night and didn’t get your top choice, I would totally buy tickets to a cheaper show for that night in order to get the VIP access for the next day.) Checking the board of available shows, we figured out that the only Cirque show available was the 9pm showing of Ka. How perfect is that? Could we possibly get 7 tickets for our first choice show at our first choice time? Heck ya! But could we all sit together? Mm-hmm, thanks to special permission at the MGM Grand’s box office! You know you’re in luck when someone in Vegas tells you it’s your lucky day. After that magic, our next stop was the Bellagio brunch. With the new diet, dining out has been a challenge. Being in a frenzy of awesome breakfast foods wasn’t easy, but I managed to make some healthy choices. Mr. Wonderful got french toast. Win some, lose some I guess! I’m not sure if it was the best omelet I’ve ever had, but it was close. (Pro tip: During the week, mimosas cost $15. On weekends, adding the champagne brunch is an extra $5, on top of the extra $9 they charge you on the weekends.) The service is also superb. We tried to pay for the coffee and orange juice. Nope. Included. Once we got the rest of the team, we went back to Paris for lunch. (Well, their lunch. We were still stuffed from breakfast.) We decided to get drinks for the road. 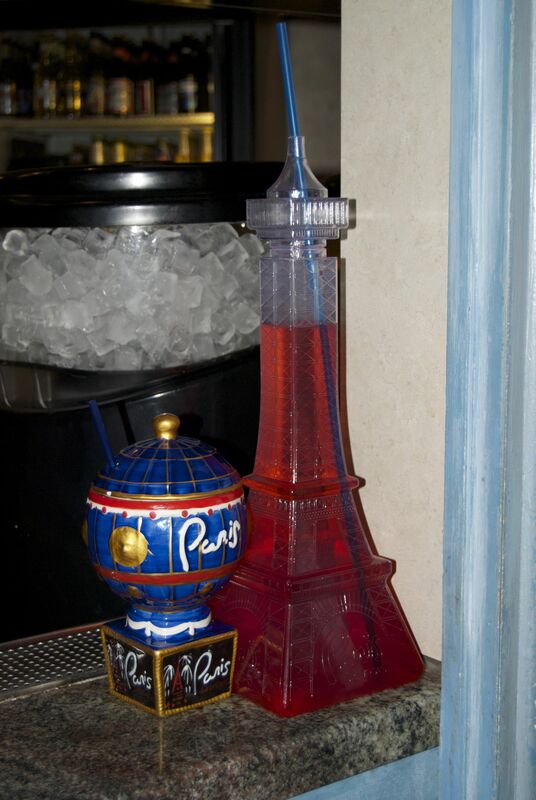 In Vegas, almost every bar has slushy machines full of your choice of frozen beverage. The bartender adds alcohol and Voila! drinks for the road. Since I like to be difficult and the Lime in the Coconut margarita is my favorite thing to order at Margarita’s, I asked for a combo piña colada/margarita. No go. Apparently you can’t mix rum and tequila. (The bartender clearly didn’t know me in college.) I didn’t realize at the time that the alcohol wasn’t in it already. I don’t know why she didn’t just ask me to pick one. We’re in Vegas for goodness sake! The obvious next stop for us was Bill’s Gamblin’ Hall and Saloon. Bill’s has pretty low table minimums, all things considered. It was the perfect place for us gambling newbies to lose some money and get a little help from the dealers. Mr. Wonderful researched Craps before we left and really wanted to try it. Smart guy. 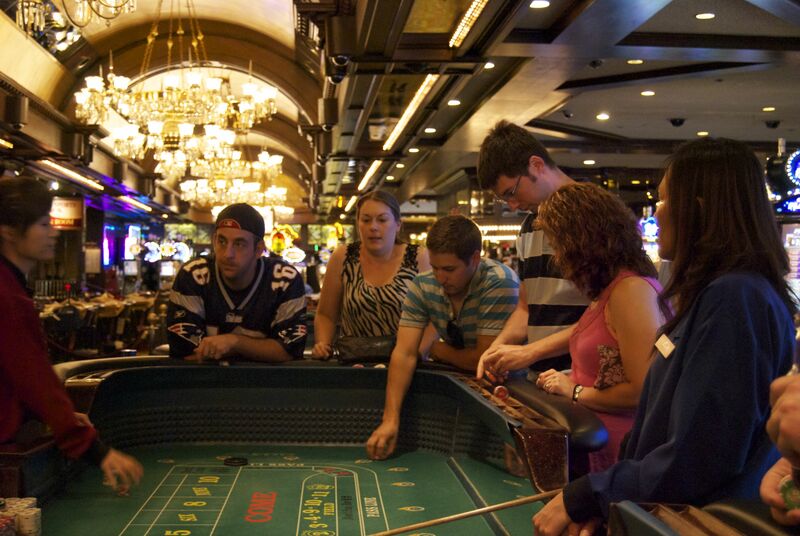 Craps is perfect for big groups because you can almost always get everyone around the same table. None of us had a clue, but the dealers were so nice to help us figure out what to do. We had so much fun, and even came out ahead. Again, thanks to Erica for this photo! After a pretty displeasing dinner and round of gambling at , we made our way to MGM for the show! Ka is a pretty awesome show. My biggest problem is that I like a narrator. The story is set up for you and then you never hear another peep from the guy. So you’re watching and you’re like, “Look, sparkly Tarzan. Wait, he’s dating the imperial daughter? Huh?” I feel like the 7 of us saw 7 different shows as a result. Still, the gymnastics of it were unbeatable. My favorite part was one of the last scenes where there are two guys spinning around what looks like two hamster wheels attached to a windmill. (We find out later that’s called the Wheel of Death. Huh.) The one guy gets outside of the wheel and starts running around the outside. As if that wasn’t scary enough, HE STARTS JUMPING ROPE! Then he loses the jump rope, but don’t worry, some slave throws it back to him and he’s off again. Between the jumps and the thirty foot free falls back the wheel, we were pretty sure we’re about to watch a man’s death. But no. That right there is worth the price of admission. Nothing like a little vandalism to kick off your weekend. Not sure what Incredible Hulk was walking between my car and my building. Or which neighbor I pissed off. But seriously? Well, TGIF nonetheless. I’m working on the rest of the Vegas recap. Just waiting on some photos from the rest of the team.